1)	Hardware cloth is throughout the inside providing a secure material for your bats to hang onto. 2)	Hardware cloth is used on the landing pad. This gives the bats something to hold onto when they are trying to enter your house. 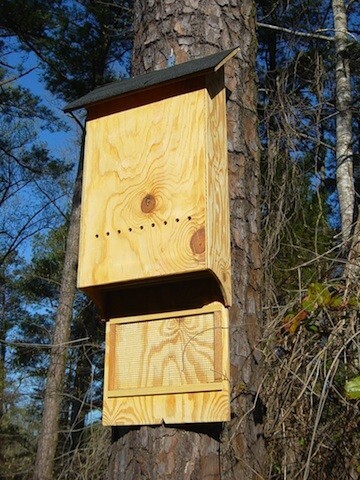 3)	All seams and cracks are sealed to prevent parasites from easy access to nest sites. 4)	Each house has a shingled roof to keep water out and act as a solar collector for heating the house. 5)	There is an attic space which is sealed off from the main living chamber. This attic serves as a heat retainer as well as a noise buffer. 6)	Each house comes with a hanger so it is ready to be mounted. 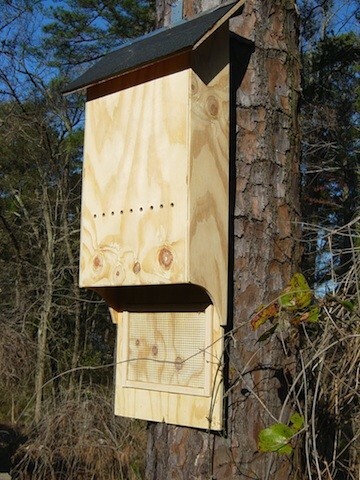 The Bat House pictured above is two chambered. It will hold 75 to 150 bats comfortably. It's dimensions are 48" Tall by 17" Wide x 3 1/2" Deep. It's shipping weight is 70 lbs. The finished colored houses are available in either Light or Walnut. The unfinished house comes with shingles, rainguard and mounting hardware. A second style of this house is available which looks just like the ones featured above except they have four chambers. The dimensions on this house are 48" Tall by 17" Wide by 7" Deep. Shipping weight is 70 lbs. They are available finished in Natural or Walnut. They are also available unfinished with shingles, rainguard and mounting hardware. We were recently interviewed for a segment FOX 5 NEWS ran during their evening news program. 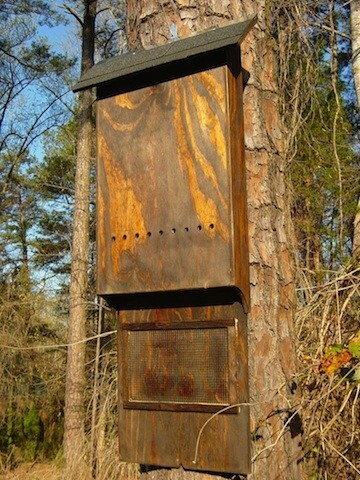 The segment talked about bats, why they are good to have around the house and features owner Jonathan Schaefer along with some of the Bat Houses we have been selling. The segment is about 4 minutes long so we posted it as two files, each about 2 minutes long and about 5 Megs in size. If you have a high speed internet connection, you will be able to stream these files playing them as they download. However, if you are using a dial up connection, you will be better off downloading them first and then playing them in their entirety. Click on the link below to go to our Video Page where you will find these files or look below this link for the other pages of our on line catalog. The story was very positive for Bats and may just be showing a changing feeling amongst the general population when it comes to this misunderstood creature. CLICK HERE FOR OUR VIDEO PAGE AND THE BAT HOUSE NEWS STORY ! !